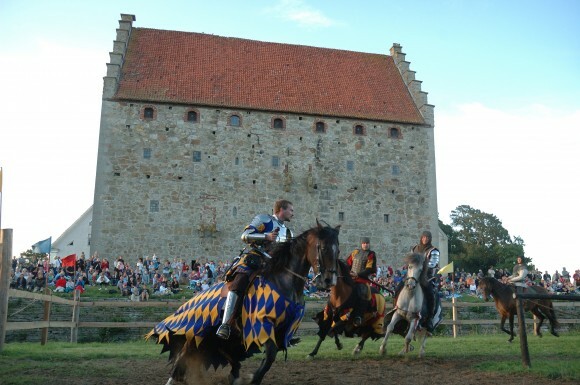 Glimmingehus, situated in the county of Skåne in southern Sweden, is the best-preserved medieval manor in Scandinavia. Jens Holgersen Ulfstand began to construct the stately fortress in the year 1499. You can search for ghosts at the fortress, try your hand at Middle Age-chores, relax in the herb garden or join a guided tour in English. Glimmingehus was established as an imposing residence for the Danish knight Jens Holgersen Ulfstand and his family. At that time Skåne belonged to Denmark. Finds from archaeological excavations have revealed the highly exclusive nature of the Glimmingehus household. The most expensive objects available in Europe in the early 16th century have been found, including Venitian glass, extruded Rhineland glass and Spanish ceramic ware. Today, Glimmingehus is a living Ancient Monument and a centre for people throughout Scandinavia interested in the Middle Ages, as well as an exciting outing. New research, both archaeological and research into building history, has helped to produce a picture of how the fortress was once built and used.